As #TheOfficialTwitterPartyDJ on Twitter, and a lifelong Music lover and all things audiophile, when hot Audio and even hotter music combine it's got MY name written all over it! 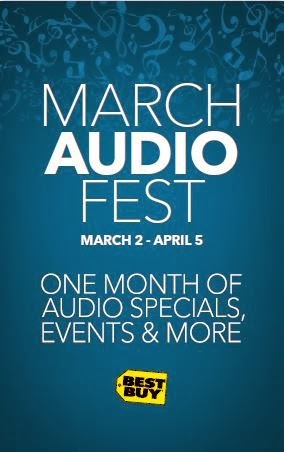 From March 2nd through MY BIRTHDAY, 4/4, Best Buy will feature one month of audio specials and deals, events and more! Guess who pimped my Music? Fellow My Best Buy Members, enter your My Best Buy Member ID HERE to enter to win a trip to see Kings of Leon - Mechanical Bull Concert in one of my favorite cities, NEW ORLEANS! If one of my butterflies win, I totally hope you bring me with you! One of my fave bands playing in one of my favorite cities, it's music nirvana I tell you! I for one can't get enough when it comes to my Music! My home theatre surround is due for an upgrade and I definitely want a 'Smart TV' for my living room so I'm totally looking forward to checking out the demo at my local store and learning about the latest and greatest in Home Audio! And I have to admit I'm already nerding out about getting to meeting Ledisi this Friday at my local Best Buy in New York City (1880 Broadway). If you were thinking about any Home Audio Updates, right now is the time to take advantage and do it at a great price! FTC Disclosure: I am a Best Buy Brand Ambassador. This allows me to share information, sales, product reviews and deals on a regular basis! This is a compensated campaign brought to you by Best Buy and JBL who provided the Flip Wireless Bluetooth Speaker for editorial consideration. All opinions are 100% my own. I am disclosing this in accordance with the Federal Trade Commission 16 CFR, Part 255 - Guides Concerning the use of endorsements and testimonials in advertising, you may visit our full giveaway and disclosure page for complete policy information. There are affiliate links in this post.